When I hear the word scones, I think of them being very British. On our trip to Devon and Cornwall a few years ago, Dave and I sampled a few cream teas. We had them with clotted cream in Cornwall and compared them to scones with clotted cream in Devon. Both were extremely good and I would hate to take sides and say one was better than the other. I have never made scones myself, but when I was a child I would help my maid when she baked scones. Every December she would go home for the Christmas holidays, and in preparation for her travels she would bake container fulls of scones. I have no idea what the recipe was, but I was allowed to cut out the shapes – a tedious job in some senses, but a lot of fun for an eight year old. So, when I decided to bake scones I turned to one of the British chef’s recipe’s books. I chose James Martin The Collection. His recipe can be found on Page 358. I was intrigued to read that scones are Scottish, there goes my theory! I baked mine at 220° Celsius for 12 minutes and I think I pushed the dough a little too flat before cutting the shapes, as they did not rise up perfectly. But, they were soft inside with a beautiful crust. They were still perfect the day after, which for us is a necessity as two people should not really scoff their way through too many in one day. I served my scones with jam and thick cream, how do you serve yours? I am submitting this to Celia from Fig Jam And Lime Cordial for International Scone Week. For the life of me, I cannot find clotted cream—your scones look PERFECT! Scones: the most wonderful thing about them (and there are many) is the fact you can have guests arrive unexpectedly and produce beautiful baked scones in a matter of minutes. And the house is filled with such a beautiful aroma! 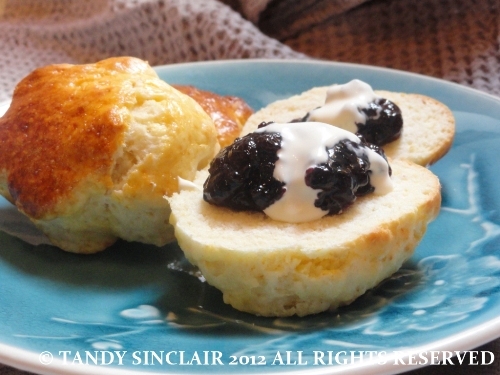 Tandy your scones look perfect to me – and perfectly served, whether it is English or Scottish, delicious is the word ! Very diplomatic about Devon vs Cornwall. Can’t believe they are Scottish though – urban myth! Homemade strawberry jam and clotted cream on mine please (then there will be none left for the next day!). I love scones, but always just buy them – never make them myself (at least, not yet). I love scones with butter and jam. I’ve been following all the scone recipes and they all sound good. Jam and thick cream sounds very decadent. I have to try the honey option! Mm, it’s the perfect scone complement! Your scones look beautiful. I used to love them with clotted cream but now, if I do eat one, it is plain. I really pursue the strategies I can to slim the recipes down. I should be following the same advice! I love the sound of that jam! I was hoping to test them on day three for breakfast, but I left them at home! funny you should say that about the scones being fine the following day. That has been one of my pet hates, that scones do not last and need to be eaten almost as soon as they cool down.